This “high concept” may sound like an excuse for an ultraviolent martial arts movie from the makers of The Transporter (and it is to some degree), but there’s an odd, surprising, gentle plot that doesn’t look very much like the trailers. An opening fight scene grabs your attention. Li, unleashed, takes out a room full of defaulters and henchmen by kicking, punching, leaping, breaking, and pulling their hair. The crazed look in his eye and the rush of adrenaline make “Danny the Dog” seem like just the right moniker for this vicious pit bull. When the collar goes back on, Danny returns to an introverted simpleton. The surprise comes ten minutes later when Danny, waiting in a piano warehouse for his master to call, encounters blind piano tuner Sam (Morgan Freeman). Danny is obsessed by pianos anyway, and when Sam lets him play one, Danny forgets all about Uncle Bart. I won’t go into detail, but eventually Danny ends up living with Sam and his stepdaughter Victoria (Kerry Condon). Over time, they give Danny back his humanity through music, attention, love, and groceries. Later, Danny encounters the old gang again, and he is pressed back into service. This time, Danny doesn’t want to fight, although he might have to fight to keep the old gang out of his new life. All the martial arts scenes in Unleashed are top notch, although for the hard-core fan, there may be too much plot and not enough action. For the really obsessive fans, the gentleness of the story (by Luc Besson, The Transporter, The Fifth Element) may even count against the film, although I have to disagree. A few sickos in my audience applauded when Danny killed a meaty monster in a death match, a moment that, to me, played more like an disturbingly comic surprise than a satisfying victory. The action scenes are almost tacked on to the rest of the plot, which results in a schizophrenic movie with many unlikely pairings. Bob Hoskins and Jet Li is the first such pairing. Hoskins reprises the gangster he played in his early career with films like The Long Good Friday and Mona Lisa. Li’s character has so little dignity that it’s almost surprising an actor with his stature would take the role. Seeing the two of them together as master and servant looks like some sort of time-warped Photoshopped hallucination. The second odd pairing is Freeman and Li playing a duet. What is Freeman, with his American accent, doing here in the UK? And who would have ever thought to cast the two of them in the same scene, playing a piano? The fact that Sam is blind and Danny is a simpleton just makes it more surreal. All of these matchups are justified by the plot, but they still feel odd. 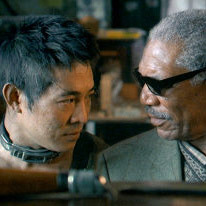 The three lead actors — Li, Hoskins, and Freeman — give good performances; each brings his character to life; but they seem like they come from different movies. This on-edge feeling is more compelling than repulsive, although others will probably disagree. There is a lot of iconic talent behind Unleashed. Louis Leterrier directs, Besson wrote the script, Yuen Woo-Ping choreographed the action, and Jet Li stars. Hoskins and Freeman add their acting skills to the mix. That’s a lot of diverse talent that makes a melange rather than something more pure. For some, that may be a drawback. For others, like me, that makes Unleashed stand out from the crowd.